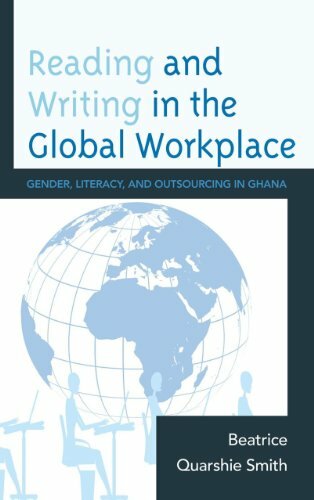 Reading and Writing in the Global Workplace: Gender, Literacy, and Outsourcing in Ghana by Beatrice Quarshie Smith explores the conditions that underlie the outsourcing of US data-processing work in Ghana. Here Beatrice Quarshie Smith describes the convergence and interplay of at least four different socio-economic forces: (1) the digital and satellite technology enabling virtual environments for global outsourced data-processing; (2) the historical development of Ghana as a politically-stable Anglophone society with a relatively strong tradition of public education; (3) the neoliberal economic restructuring policies advanced by the World Bank and the International Monetary Fund; and (4) the ready availability of women seeking to enter the formal wage economy either to seek independence from their roles within traditional families, or in order to support their families. The author’s comparative study of two distinctly different workplaces reveals significant insights about problems of organizational hierarchy and management-employee relations in the cross-cultural environments of out-sourced business and IT process work. Through extensive interviews, the book sheds light on the educational backgrounds, day-to-day struggles, fears, and aspirations of the workers. Quarshie Smith develops this multi-faceted analysis with keen insights into the representational limitations and ethical responsibilities of the researcher. This pioneering study about outsourced data-processing work in West Africa opens up a new area for research and offers a fresh perspective from which to consider outsourcing in other regions of the globe.